This hilarious comedy about the known and the unknown was conducted by a woman who knew nothing in the first place! Ellen small (Dorothy Paul) was the wee woman from Maryhill with big ideas. She wanted to make contact with her dead sister to fulfill a promise made years ago on the top of Ben Arthur. Regardless of the feelings of her two daughters Audrey and Gemma, she enlisted the help of Mr Proudfoot, a part-time medium from Kilmarnock. Their combined dabblings in the spirit produced a chain of hilarious events, unlocked hidden powers and family secrets, and ensured that no-one escaped the ‘ghosts’ from the past! Was Ellen psychic or mad or both? 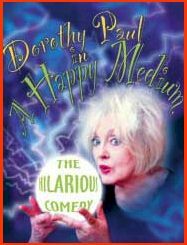 Dorothy Paul brought to the part of Ellen all the warmth, comedy and feeling for flawed humanity she displayed in her famous one-woman shows. Hilarious wish they would bring it out on dvd or TV.